Earlier in the 2012-2013 academic year, UCLA’s Academic Senate was asked to make a recommendation regarding the Campus Climate Reports. It distributed the reports to its committees for review. The Undergraduate Council’s negative recommendation was recently made public, and is copied below. Shortly after this letter was issued, the Academic Senate dropped its review of the Reports and declined to issue any formal findings. 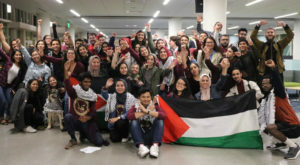 Students for Justice in Palestine at UCLA is a diverse group of students educating and organizing at the University of California in support of Palestinian rights. Our group advocates for the end of the Israeli military occupation of the West Bank and Gaza Strip, for equal rights for Palestinian citizens of Israel, and in support of the rights of Palestinian refugees as outlined by international law. As clearly stated in our constitution and in statements we have signed, our group is clearly and unequivocally opposed to all forms of bigotry and hate, including but not limited to racism, sexism, homophobia, and anti-Semitism. We understand that the Academic Senate has been asked to provide its opinion on the recently released Campus Climate reports. Because the reports have serious implications for the rights of our members, and because we have been largely excluded from the process of generating them, Students for Justice in Palestine would like to take this opportunity to explain our position and urge the Academic Senate not to endorse the report’s dangerous recommendations. We oppose the Campus Climate reports on two major grounds, first that it constitutes an effort to censor and repress pro-Palestinian speech on campus; and second, that the report was formulated and written in an illegitimate manner that is symptomatic of a biased approach to these issues by the University of California Administration. Efforts to review sponsorship of events or take steps to ensure balance constitute a clear threat to the free speech rights of students and faculty. Which campus administrative body will be in charge of determining which speakers and events are acceptable and which require balancing? Will they enforce this rule for all topics and not just those related to the injustices of Israel’s occupation? We raise these questions not to indicate that we would endorse the recommendation if further elaborated, but to highlight the clear potential for political speech on campus to be monitored, judged, and censored. Moreover, applying these recommenda- tions only to speech advocating for Palestinian rights will render pro-Palestinian students second class citizens at the University of California. We affirm that our speech is not hate speech. We support the equal rights of Palestinians and the application of international law to their situation. We do not engage in or support violence against, the demonization of, or discrimination against any group or people. Our constitution, long track record of opposition to all forms of bigotry, and the absence of any accusations made against our group should confirm that we are not and have not been practitioners of hate. Unfortunately, the report repeatedly fails to distinguish between criticism of Israeli policy and anti-Semitism, raising the possibility that legitimate criticisms of Israel’s human rights abuses will be categorized as hate speech. As such, we are concerned that instead of promoting tolerance, this recommendation will instead have the effect of sup- pressing views critical of Israeli policy. Therefore, while we are opposed to hate speech, we are skeptical as to how it will be defined and the biases that might be present in the processes used to determine it. Our student group opposes anti-Semitism and works to clearly define our work as critical of Israeli policy, not critical of any ethnic or religious group. But we are worried that an adoption of a definition of anti-Semitism that includes criticism of Israel will blur the distinction between criticism of state policy with criticism of racial, religious, or ethnic groups. This would be akin to labeling criticism of American policies as anti-American, a possibility that echoes past efforts to stifle free speech in our country. Our concerns stem from the report’s reference to the 2005 working definition offered by the European Union’s Monitoring Centre on Racism and Xenophobia (now renamed to the Fundamental Rights Agency). The defini- tion offered by this working group (which has since been dropped) is not problematic in our view, but the examples that accompany that definition clearly include criticism of the State of Israel as examples of anti-Semitic speech. We are extremely worried by the possibility that these examples might be incorporated in a definition of anti-Semitism at the UC. The working definition reads: “Anti-Semitism is a certain perception of Jews, which may be expressed as hatred toward Jews. Rhetorical and physical manifestations of anti-Semitism are directed toward Jewish or non-Jewish individuals and/or their property, toward Jewish community institutions and religious facilities.” We endorse this view. But we object to the examples cited, which include criticism of Israel such as “Denying the Jewish people their right to self-determination, e.g., by claiming that the existence of a State of Israel is a racist endeavor,” “Applying double standards by requiring of it a behavior not expected or demanded of any other democratic nation,” and “Drawing comparisons of contemporary Is- raeli policy to that of the Nazis.” While our group is focused on advocating for Palestinian rights and is not engaged in these debates, we believe that if these examples of speech be- come part of a common understanding of anti-Semitism, it will move legitimate, non-bigoted criticism of Israel outside the bounds of acceptable public discourse. If this recommendation were to be adopted and the UC defined anti-Semitism as something which included criticism of Israel, it would effectively label our student group as a hate group and in fact smear many professors and students whose research deals with Israel’s discriminatory policies. We view each of these three recommendations as leading down the same dangerous path. Whether outright banning speakers from campus, forcing balance upon events and groups, defining hate speech, or labeling criticism of Israel as anti-Semitic, each of these recommendations has the frightening possibility of both misrepresenting our group and limiting our speech rights on campus. Be- cause these recommendations single out pro-Palestinian speech for special treatment, they would effectively make us second class citizens on campus with fewer rights to free speech than other students. We believe that just as critics of American policy should not be restricted from engaging in free speech on campus by being labelled anti-American or forced to include balance at their events, we too should not be subject to these limitations on our ability to advocate for our beliefs. We have no objections to the other recommendations listed in the report that deal with dietary needs, cultural competency, and religious accommodations and we regret that the legitimate religious and cultural needs of students have been mixed with clear attempts to limit speech that is objected to by other groups on campus. We wish to point out that the Jewish Students’ Campus Climate Report offers no substanti- ated evidence that SJPs have engaged in hate speech. Considering that the recommendations it makes have the potential to enact sweeping censorship on campus, we would expect that there would be ample documentation backing claims of inappropriate behavior. Rather than this being the case, it is simply asserted as if fact that SJPs have committed offenses. How- ever, we strongly reiterate that we have not been accused of any provable instance of hate speech. We can neither apologize for nor defend ourselves against claims that are not backed by any evidence. We find this to be extremely troubling given the serious consequences that can stem from these accusations. Richard Barton, one of the co-chairs of the report, is a member of the Anti-Defamation League (ADL), a political organization that has a record of attacking Students for Justice in Palestine and other organizations in support of Palestinian rights (including other groups that have voiced objection to these reports, such as Jewish Voice for Peace and the Council on American Islamic Relations). In 2010, this organization placed SJP (as a collective national body, which we are not) on a list of the top-10 anti-Israel groups in America. After this inci- dent, SJP chapters, including every chapter in the UC system, took the opportunity to write a joint public statement reiterating our longstanding opposition to all forms of racism and bigotry, including anti-Semitism, and reiterating our clear and principled stance in support of Palestinian equal rights. Given the ADL’s prior attempt to misrepresent our organization, we are concerned that the appointment of a high ranking member of this group may have brought bias or a political agenda into the process. In the same vein, there is ample evidence that the report excluded opinions that ran contrary to its findings. In addition to the serious questions regarding the report’s methodology raised in the attached letter from the Ad Hoc Jewish Committee, Jewish students who did not agree that criticism of the state of Israel’s policies constituted anti-Semitism have also confirmed that the testimony they gave to the report’s authors was omitted from the final report. We also note that, like at other UC schools, our SJP has many Jewish students whose opinions and beliefs were not included or solicited, who also do not believe that criticism of Israel is hate-based, and who would also be censored and silenced by the report’s recommendations. While the Jewish Students Campus Climate report spent a great deal of time on the Israel- Palestine debate on campus, the Muslim and Arab report was primarily focused on reli- gious and other cultural concerns for those students. The framing of this issue as a Jewish-Muslim problem provides an inaccurate religious connotation to a political disagreement about rights and state policies. Political disagreements about state policies of Israel do not fall uniquely along religious or ethnic lines and they do not represent a shorthand for inter-religious or inter-communal tensions on campus. To frame these oppressions as a disagreement between Jews and Muslims is to inappropriately simplify those religions by condensing their long, diverse, and rich legacies into a contemporary political question that is not representative of those religions, their diverse adherents, or their long histories. It also erases from view Jewish, Christian, Hindu, atheist and other students in our group, something which no campus administration should ever allow to happen. At UCLA, our group was not contacted or consulted about the reports save a small and nowhere near comprehensive online survey briefly posted to our Facebook group. This is no substitute for an engaged interview of SJP members that would allow us to voice our substantive concerns and defend ourselves from what we consider baseless or politicized accusations. More importantly, it is not the place of Muslim and Arab students to represent SJP, to be used as a substitute for our group, or to be asked to administer a survey about our experiences. We can speak on our own behalf, and as a party that will surely be affected by the report, SJP should have been included in this process. The Muslim/Arab report did at times reference issues relevant to SJPs, but this is not equivalent to or an adequate replace- ment for the active involvement of our groups in this process. We are deeply concerned that this exclusion of SJP has persisted through the current UCLA review process, and we at- tach several important documents by the National Lawyers Guild, Center for Constitutional Rights, Jewish Voice for Peace, and Middle East Studies Association that we strongly believe that the review should include. In his public statements about the formation of the Campus Climate process, Pres- ident Yudof stated that he initiated these reports in response to “the unfortunate events of spring 2010,” one of which was a political protest at UC Irvine, now re- ferred to as the Irvine 11 incident. Framing the Irvine 11 as a problem is an example of the troubling political orientation of the Campus Climate process and the singling out of pro-Palestinian speech for additional scrutiny. Similar protests of government speakers happen regularly, including an identical protest this spring by a student immigrant rights group at UCLA against a speech by US Secretary of Homeland Security Janet Napolitano. We do not view these types of protest as a problem and are therefore troubled by the origin and framing of the reports. Second, in November of 2011, President Yudof made public comments to the Anti Defamation League supporting the backdoor censorship of SJPs at UC Irvine. Third and most recently, President Yudof’s office revealed that he had given strong endorsement to much of HR35, the widely condemned California Assembly resolution that defines terms like apartheid as hate speech when applied to Israeli policy and recommends broad forms of censorship against pro-Palestine groups on campus. For these reasons, we do not have confidence in President Yudof’s ability to administer the Campus Climate process in a fair manner. We also wish to call to your attention the many attempts at censorship that have occurred throughout the UC system and at UCLA as well. These have created a climate of intimidation for pro-Palestinian students, summarized with examples in the attached Center for Constitutional Rights letter. In the past year at UCLA, Professor David Shorter of the UCLA World Arts and Cultures Department was the target of a censorship attempt, and last week, a graduate student teach in about Gaza held at UCLA was plagued by repeated calls for censorship. This was a traumatic experience for many students and we foresee this becoming the future for our political speech should the recommendations listed in the Campus Climate Report be adopted. In summary, we write to express strong objection to several recommendations in the Campus Climate Reports, particularly three that, if adopted, will lead to the censorship and second-class status of pro-Palestinian students at UCLA. We believe that the process by which the reports were written has not been impartial and has not included the viewpoints of pro-Palestinian student groups. We are also deeply troubled that the Academic Senate is entering a review of these reports without consideration of our position on any of these matters. We are afraid that the systematic exclusion of our group, which has the most to lose from this process, will result in an uncritical review. We attach for your consideration a series of letters and documents which we believe provide im- portant context and support for the positions we have laid out in this letter. We urge you to consider them. Please contact us at sjpucla1@gmail.com with any questions, concerns, or requests for clarification that you may have.